Mark Edward Lambert (43): Mersey Street, Leigh - Drink driving on Priestners Way: 12-month community order made with rehabilitation requirement and 60 hours of unpaid work, disqualified from driving for 12 months, pay a surcharge to fund victim services of £85, pay £450 costs to the Crown Prosecution Service. David John Wane (35): Brecon Drive, Hindley - Damaged a window belonging to Della Wane to the value of £100, communicated with Della Wane while prohibited from doing by a non-molestation order: Pay compensation of £100, pay a surcharge to fund victim services of £85, pay costs of £85 to the Crown Prosecution Service, community order including 60 hours of unpaid work with rehabilitation activity requirement. 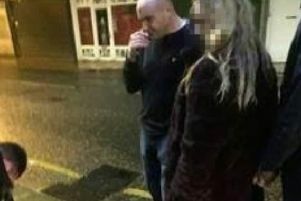 Allan Wardle (46): Prescott Street, Leigh - Stole a black bag containing £60 in cash and a mobile phone of unknown value belonging to Christine Reading: Six-week prison sentence suspended for 12 months, pay a surcharge to victim services of £115, pay costs of £85 to Crown Prosecution Service. Stefan Bradbury (34): Diamond Street, Leigh - Stole alcohol and food to the value of £223 from Tesco in Atherton, committing an offence while a suspended sentence in operation given for theft: Jailed for 12 weeks, pay a surcharge to victim services of £115. Jamie Devlin (23): Hurst Street, Leigh - Damaged an iPhone to the value of £350 belonging to Gemma Metcalfe, assaulted Gemma Metcalfe: Community order with 80 hours of unpaid work, pay a surcharge to victim services of £85, pay costs of £85 to the Crown Prosecution Service, pay £350 compensation. Adam James Hutchinson (26): Leighton Street, Atherton - Drug driving on Leigh Road, Atherton, drove without a licence and without insurance: Fined £280, pay a surcharge to fund victim services of £30, disqualified from driving for 24 months. Jonathon Thompson (28): Pilling Street, Leigh - Damaged windows, a door panel and a television set to the total value of £900 belonging to Amber King, assaulted Amber King by beating: Restraining order not to contact Amber King or enter Kenneth Grove, Leigh, fined £266, pay £700 compensation, pay a surcharge to fund victim services of £30, pay £85 costs to the Crown Prosecution Service. Brian John Rearden (33): Devonshire Road, Atherton - Failed to comply with supervision requirements following a release from custody, stole an Xbox to the value of £249 from Kate McKernan: Jailed for 28 days as second breach of a post-sentence supervision order, pay a surcharge to fund victim services of £115. Liam Smyth (55): Woodford Court, Woodford Street, Hindley - Breach of the peace: Bound over in the sum of £100 for 12 months. Ryan Thomas Edward Renshaw (21): Derby Road, Golborne - Used towards Anthony Dale threatening, abusive or insulting words or behaviour, harassment of Anthony Dale and Christina Dale, failed to surrender to custody: Jailed for 16 weeks, restraining order not to contact Anthony or Christina Dale or enter Walters Green, Golborne, pay a surcharge to fund victim services of £115. Neil Eric Pye (47): Mornington Road, Hindley - Assaulted Beverley Unsworth by beating: 12-month community order with rehabilitation activity and 50 hours of unpaid work, pay £50 compensation, pay a surcharge to fund victim services of £30, pay £85 costs to the Crown Prosecution Service. Shaun Thomas Randall (24): Chaucer Grove, Atherton - Assaulted a police officer in the execution of his duty: Six-month community order with curfew for 12 weeks, pay a surcharge to victim services of £85, pay costs of £85 to the Crown Prosecution Service.